The half moon mani was the coolest thing to me and I was determined to try it when I saw it in InStyle's magazine last year. 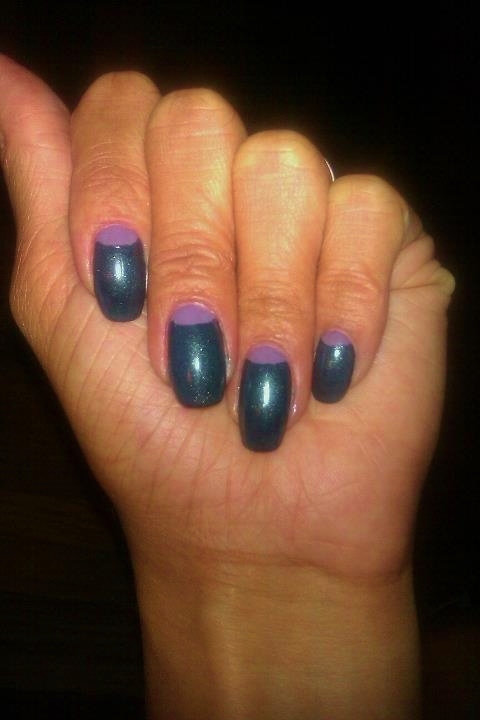 Such an easy style, and quick way to save your 2-3 day old polish when the edges are wearing thin. I call this Strike One because not only was it my first attempt, but I also didn't like the combination of colors I picked out. Thoughts? Feelings? Concerns? Half moons are in Ulta "Fine Pruned" and body is Sinful Colors "Secret Admirer" For some reason the SC looks blue, but this is a sparkly black color. I imagine its due to the effect of the purple under color.